The thirds at a lie in the first two positions. At b, the upper note is taken on the lower string, and either in the 3rd, 4th, 5th or 6th position. 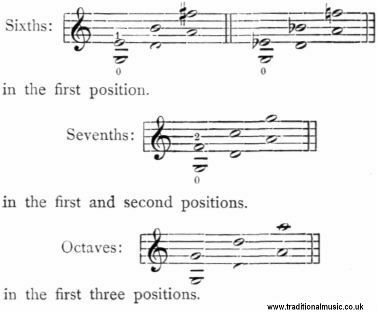 a lies in the first position, at b the higher note is again produced on the lower string (as a harmonic note) in the 4th position. The perfect fifths in this example have each two open strings; the imperfect fifths are played either in the first or half position.